Word on the street: With Memphis rap having a moment, Young Dolph is up next. The Memphis rap scene is on an upswing. Yo Gotti has received his long-awaited taste of the spotlight. Juicy J. inked a deal with Wiz Khalifa's Taylor Gang imprint, bringing him fresh exposure. And newcomer Don Trip signed with Interscope Records and was also featured in the 2012 "Freshman Class" for hip-hop magazine XXL. On the last verse of Don Trip's "The Life (Remix)," which also features Yo Gotti and Juicy J., a voice can be heard spitting the words, "Word on the street, Young Dolph up next." That's the voice of Adolph Thornton Jr., known to the rap world as Young Dolph. Hailing from South Memphis' Castalia Street, he's next on the city's list of artists to attract national shine, if all goes as planned. "My music comes 100 percent from my life," said Dolph, a 26-year-old graduate of Hamilton High. "What I'm going through, what I've went through, [and] what I'm 'bout to go through. I'm putting it out there on the table." Dolph had a passion for music as a kid, listening to rap artists such as Master P., UGK, Playa Fly, and Three 6 Mafia, but he didn't consider trying his hand at it until his adult years. After studying the blueprint of Southern rap legend Master P., he decided to jump into the game independently. Along with friend "Daddyo," he runs the record label Paper Route Empire. He's thus far released four mixtapes under the label. He's also in the group the Skrilla Squad with labelmates Muney Makin Murda and Tim Gates. On March 27th, he's releasing his latest mixtape, A Time To Kill, a collection that he thinks will solidify his spot among the city's elite. It will be available exclusively on livemixtapes.com. "I gave them that different variety to let them see that I do this type of music, that type of music, and now it's back to the basics," Dolph said. "I'm back on my street thing. Where it all came from. That's what [the fans] want, so I'm going to give it to them. That's the number one thing, to keep them happy." Named after the popular film starring Samuel L. Jackson and Matthew McConaughey, the new mixtape will feature Memphis' own Zed Zilla, Don Trip, and Juicy J., along with Atlanta's Gucci Mane and Nashville's Starlito. It will have production from Drumma Boy, DJ Squeeky, and Young Neiman, the in-house producer for Paper Route Empire. Listeners can expect content centered on the pros and cons of indulging in the street life, dressing in the latest foreign fashion, and enjoying the best Cannabis sativa that money can buy. However, Dolph is also bringing listeners closer inside his personal life with A Time To Kill, something that he's kept to a minimum on previous releases. On songs such as "Much Deeper," he talks about the effects of losing his grandmother — who raised him — and his uncle. He also reflects on his nearly-fatal 2008 car crash, which he credits as his motivation to take rap more seriously. "I fell asleep driving, doing like 90 miles a hour," Dolph said. "The truck looked like a car when it was through. The ceiling was smashed all the way in. The steering wheel was off. It made me put everything to the side and focus on music, because I never knew what might happen." He released his first mixtape, Paper Route Campaign, the same year as the car accident and began doing his homework to "understand the game more." Although his first mixtape was well received in Memphis, it wasn't until he delivered Welcome to Dolph World in 2010 that he gained a significant amount of exposure in the South. "That's what got everybody's attention. It really took off faster than I thought it would," Dolph said. "To this day, I'll be in traffic and people will pull up on me bumping Welcome to Dolph World. I jump out at the gas station and [they're playing] it." Hosted by DJ Scream — a recent signee to Rick Ross' Maybach Music Group — the mixtape featured 2Chainz, 8Ball, and Dolph's Paper Route Empire brethren. It had street bangers "Flavor," "I'm Blessed," and "I Need My Medicine," which has a video that's reached nearly 300,000 views on WorldStarHipHop.com. The following year, Dolph brought fans two more mixtapes: High Class Street Music, hosted by DJ Holiday, and High Class Street Music 2: Hustler's Paradise, hosted by Bigga Rankin. Featuring smashes with Don Trip, Juicy J., and Gucci Mane, both collections were well received and catapulted Dolph's fan base outside the region. Dolph said his plan is to keep this momentum going, taking both his career and record label to the next level in the process. And by appearing alongside popular artists on songs, receiving interest from major labels, and continuing to build his buzz, he seems to be on his way. "Right now, I'm grinding," Dolph said. 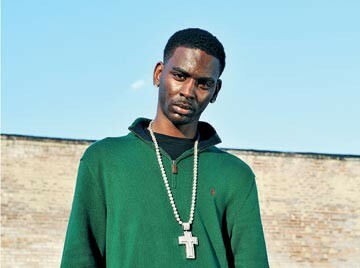 "Everybody pretty much knows about Young Dolph right now in the rap game, whether it's rappers or producers. Everybody is hearing about me. Everybody is saying, 'Let me find out who this Dolph guy is.' My name is ringing. I just have to keep feeding the streets and the fans, because they're addicted now."